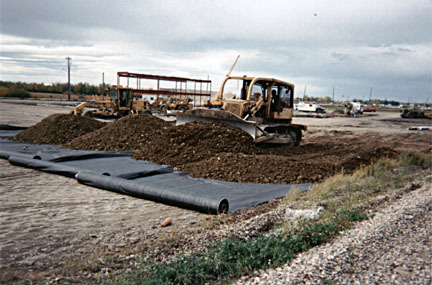 Woven Polypropylene slit-film geotextiles are used for subgrade stabilization and other applications requiring strength. Standard woven slit-film polypropylene geotextiles, usually called "wovens" are an economical range of geotextiles that combine high strength with low cost. These materials are made by weaving pre-stressed polypropylene tapes in a simple weave pattern. The resulting fabric has a high strength to weight ratio. Slit-film wovens are primarily used in roadbuilding and embankment construction but can be used in most applications requiring the separation of one type of soil from another. Slit-film wovens help to speed construction with short term reinforcement of the base. Slit film wovens can also be used in sediment control products such as floating silt curtains and silt fence. We can fabricate this product in panels of up to 85' (26m) wide. Woven monofilament geotextiles are used with erosion protection armour systems on shorelines to prevent undercutting and washout. Typar geotextiles combine strength with excellent retention of soil fines for drainage and other applications.